This section describes how to create a new page with a form for getting data from users. The page will display a form with a name input field and an email input field. After getting those two pieces of information from the user, the page will echo the entered values back for confirmation. The class extends from yii\base\Model, a base class provided by Yii, commonly used to represent form data. Info: yii\base\Model is used as a parent for model classes not associated with database tables. yii\db\ActiveRecord is normally the parent for model classes that do correspond to database tables. If you have an EntryForm object populated with the data entered by a user, you may call its validate() method to trigger the data validation routines. A data validation failure will set the hasErrors property to true, and you may learn what validation errors occurred through errors. 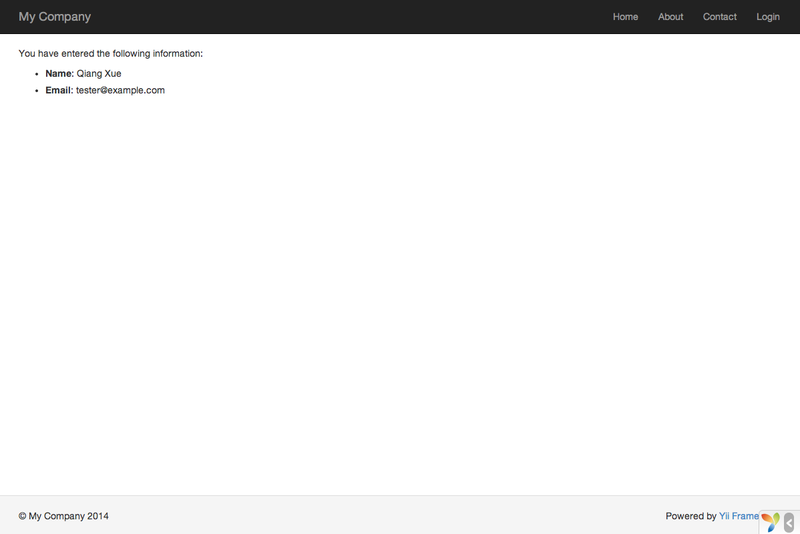 Next, you'll need to create an entry action in the site controller that will use the new model. The process of creating and using actions was explained in the Saying Hello section. The action first creates an EntryForm object. It then tries to populate the model with the data from $_POST, provided in Yii by yii\web\Request::post(). If the model is successfully populated (i.e., if the user has submitted the HTML form), the action will call validate() to make sure the values entered are valid. Info: The expression Yii::$app represents the application instance, which is a globally accessible singleton. It is also a service locator that provides components such as request, response, db, etc. to support specific functionality. In the above code, the request component of the application instance is used to access the $_POST data. If everything is fine, the action will render a view named entry-confirm to confirm the successful submission of the data to the user. If no data is submitted or the data contains errors, the entry view will be rendered, wherein the HTML form will be shown, along with any validation error messages. Note: In this very simple example we just render the confirmation page upon valid data submission. In practice, you should consider using refresh() or redirect() to avoid form resubmission problems. Finally, create two view files named entry-confirm and entry. These will be rendered by the entry action, as just described. The entry-confirm view simply displays the name and email data. It should be stored in the file views/site/entry-confirm.php. 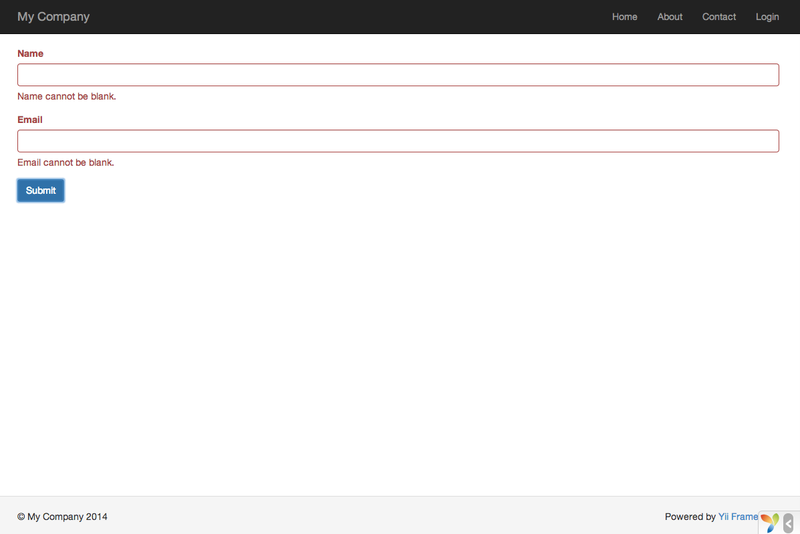 The entry view displays an HTML form. It should be stored in the file views/site/entry.php. The view uses a powerful widget called ActiveForm to build the HTML form. The begin() and end() methods of the widget render the opening and closing form tags, respectively. Between the two method calls, input fields are created by the field() method. The first input field is for the "name" data, and the second for the "email" data. After the input fields, the yii\helpers\Html::submitButton() method is called to generate a submit button. You will see a page displaying a form with two input fields. In front of each input field, a label indicates what data is to be entered. If you click the submit button without entering anything, or if you do not provide a valid email address, you will see an error message displayed next to each problematic input field. After entering a valid name and email address and clicking the submit button, you will see a new page displaying the data that you just entered. You may wonder how the HTML form works behind the scene, because it seems almost magical that it can display a label for each input field and show error messages if you do not enter the data correctly without reloading the page. Warning: Client-side validation is a convenience that provides for a better user experience. Server-side validation is always required, whether or not client-side validation is in place. The labels for input fields are generated by the field() method, using the property names from the model. For example, the label Name will be generated for the name property. Info: Yii provides many such widgets to help you quickly build complex and dynamic views. As you will learn later, writing a new widget is also extremely easy. You may want to turn much of your view code into reusable widgets to simplify view development in future. In this section of the guide, you have touched every part in the MVC architectural pattern. You have learned how to create a model class to represent the user data and validate said data. You have also learned how to get data from users and how to display data back in the browser. This is a task that could take you a lot of time when developing an application, but Yii provides powerful widgets to make this task very easy. In the next section, you will learn how to work with databases, which are needed in nearly every application.